I remember back in the day when suits were such a professional uniform for the office or Sunday morning church attire. These days, suits have expanded their reach beyond the classic, "stuffy" business attire and have become more fun and flexible. No longer are suits just worn with your classic heel or comfy flat but also with a fly pair of sneakers. You may be thinking, "I'd love to pull off sneakers and a suit but I can't". Oh but you can my Sole Sista, and I'm going to show you how. You can wear a suit with sneakers in the form of pants, skirts, or even shorts. There are so many options of styles and colors. One thing to look for though is a suit that fits well even if it's an oversized suit. 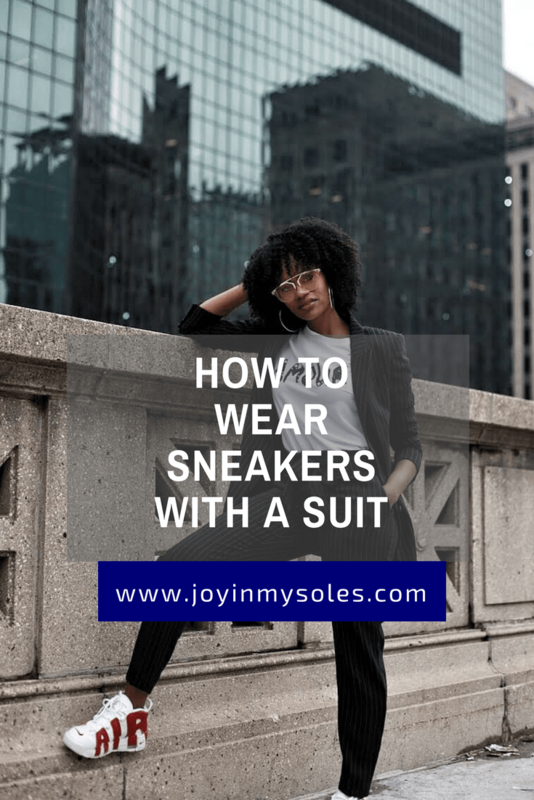 Suits are such a polished and professional look and you want to make sure you still look put together in your suit even if you're rocking sneakers. Another thing to note is to make sure the suit is more along the lines of a business or work type of suit, not a suit you could wear as the mother of the bride. Basically, what I'm saying is, you don't want the suit to be over the top dressy. Now, let's talk what kind of sneakers to rock with your suit. The style of sneaker will depend on the type of suit you are wearing. If you are wearing a pantsuit and your pants are narrow-leg, straight-leg or cropped like mine are in the pictures, you can wear pretty much any type of sneaker whether it's low top, mid top, or high top. If your suit is wide-leg, stick to a low top sneaker. If your suit is a short set or a skirt, your options are open and you can get away with a low, mid, or high top sneaker. Now that you have your suit and sneakers, what kind of top should you wear? I'm glad you asked! You can do pretty much anything from a tee like I'm rocking or a blouse. It just depends on how casual you want to be. Think you're ready to rock a suit and sneakers? How do you feel about this look, slam it (nah sis, try again) or jam it (yes girl, love it!)? Let me know in the comments!